ssaying is the analysis of ore to determine its content. By the sixteenth century, the techniques developed to analyze ore were well-known and quite successful, especially when identifying precious metals. In this period, precious metals were in high demand because used not only as currency but also as a form of investment. 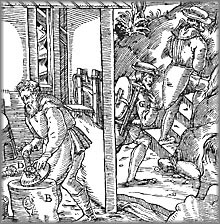 The same assaying techniques were used throughout Europe and were outlined in various illustrated treatises published in the first half of the century - particularly by German metallurgists - culminating with De re metallica (1556) by Georg Bauer, alias Agricola. In addition to those specializing as assayers, many people involved in the processing of precious metals might on occasion conduct an assay. They included refiners, goldsmiths and silversmiths, wire-drawers, beaters and coin stampers. 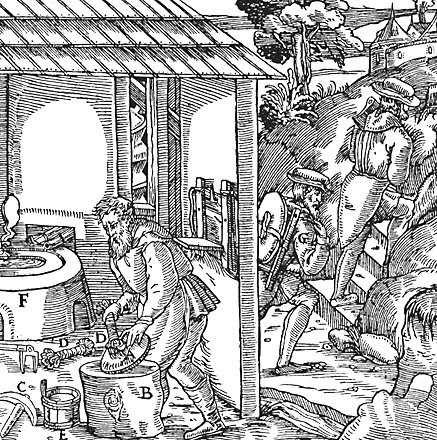 The refiner was the principal person involved in the trade in gold and silver in the 1500s. He purchased unrefined plate-metal from ore-producing regions, separated gold or silver from other substances in the plates, and melted the precious metals into ingots which he sold. Refining was similar to assaying, except on a much larger scale. It was the goldsmiths and silversmiths, wire-drawers, beaters and coin stampers who purchased these ingots, to use in making various luxury items. The skill of the assayer was used at various points in production to guarantee that the ore and finished products were of high quality. For example, he assisted in locating the most profitable mineral deposits at the mines, he analyzed the metal plates before refining, and he examined the ingots produced by the refiners. The marks of the assayer and the Crown, along with the precious-metal content, were noted on each ingot. In addition, an assayer might be used by anyone purchasing ingots, to verify their quality. Two methods existed for assaying: wet and dry, the latter being more common. Methods also varied according to the type of ore being tested. Various "recipes" were available for assaying, involving the use of different chemicals. 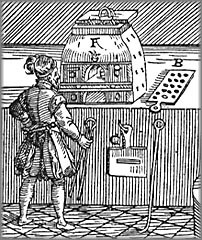 An assayer is observing the crucible that he has just placed in a furnace with a pair of pincers. The board hanging to his right could be used to protect his face from the heat and his eyes from the light and sparks (note the observation slot). Sixteen samples are arranged on a plate of hot metal to the right of the little furnace. In the dry method to separate precious metal from slag, the assayer ground up the ore sample in a mortar, weighed it with a balance scale, and placed it in a special container to ensure that nothing was lost. In a furnace, the crucible was heated underneath a muffle topped with red-hot coals. The muffle protected the sample from ashes and other debris. When the crucible turned red, a small amount of lead was added, followed by the ore. When the ore sample had melted, more lead was added and mixed in with a glowing coal to dissolve any silver and gold. After about an hour, the crucible was taken from the furnace and tapped to make the lead and metal fall to the bottom. The slag would float and stick to the sides. 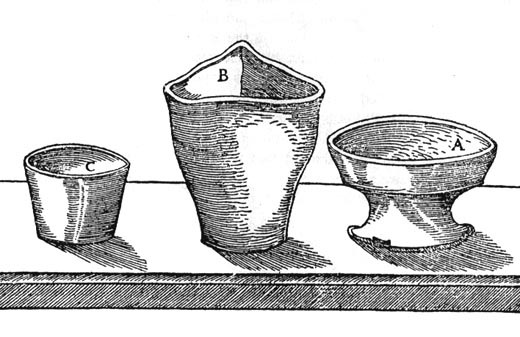 Once cooled, the crucible was broken up and the lead-gold-silver alloy removed. Muffles were used to protect the ore samples from ashes in the furnace and to allow the heat to reach the samples. This alloy was weighed and placed in a pre-heated cupel, a container made of compressed bone ash which filtered molten metals. In a well-ventilated furnace, the lead melted, oxidized and passed into the pores of the cupel, leaving only a bead of precious metals. The bead was weighed to determine the precious-metal content in the sample of ore. This bead included both gold and silver; the assayer needed to know what their proportions were. Acid was used to eliminate the silver, leaving the gold intact. The bead was first hammered flat, to increase the surface with which the acid made contact, and then placed in a nitric acid solution. Heating the acid would speed up the process. The remaining metal, gold, was weighed to determine the exact proportions of gold and silver. An alternate method employed antimony sulphide; it reacted with the silver to produce an alloy that also extracted the gold from the ore. The alloy could then undergo cupellation, or simply be oxidised by air blasted from bellows. This method could be used directly upon ore and was employed by Burchard Kranich on ore brought back from Meta Incognita. There were other methods to identify the metals in an ore sample. The colour could be examined; a yellow colour, for example, suggested sulphur's presence. Or the assayer could heat a sample and/or add other substances to provoke a chemical reaction. The resulting odour or altered state provided clues as to the metals present. 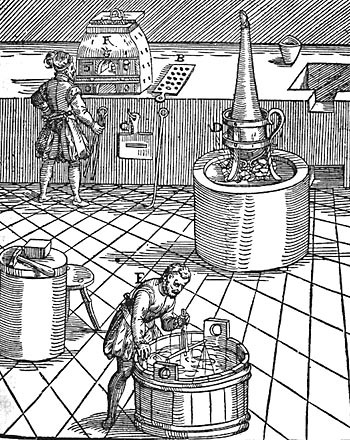 There were limitations to assaying in the sixteenth century. Substances used by assayers to analyze ore were not always pure. An assayer could identify in an ore sample the more common metals such as gold, silver, iron, copper and lead, but he could not name all the elements. In the 1500s, chemists were aware of less than 20 of the 106 basic elements we know today exist in nature. None of the methods used by assayers to identify metals were free of problems, and it was not unknown for assayers to fake results. The only way of overcoming these problems was to repeat tests on samples several times and to have other assayers conduct tests. The small sample of ore brought back from Frobisher's first voyage was not sufficient to permit extensive double-checking.